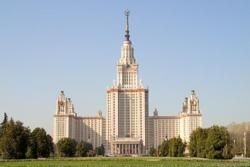 Moscow State University (the new building) is located on Sparrow Hills near the Moscow River and is Alma Mater for many Russian students. Founded in 1755, it is the oldest university in Russia and one of the country’s most prestigious and best universities. The new building was completed in 1949–1953. The university’s highest section is 36 floors and 194 metres tall. The building has a star weighing 12 tons at its peak (240 metres). It's a symbol of Russian science, fundamental high-quality knowledge and an example of Stalinist architecture, embodying the idea of the "happy communist future" by its aspiring monumental and magnificent construction blocks. 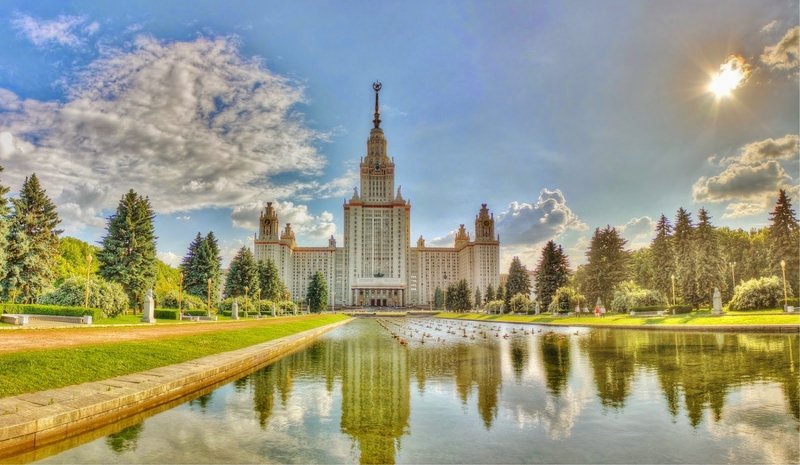 Moscow State University (MSU) is the largest university in Russia with 39 faculties and 15 research centres. 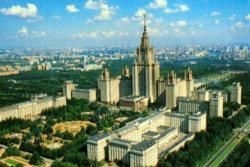 The Science Park of Moscow State University has 70 small, innovative companies which conduct research primarily in chemistry, biotechnology, medicine, ecology and development of research equipment. There are approximately 9 million books in the university library. It also has its own publishing and cultural centre. Education at MSU is free for many students. The only condition to receive free education is passing entrance exams. However, about 15% of students choose to apply at their own expense. The university is open to international students. It has American, British, French, German, Italian, Chinese and many other international partners. In addition to local branches, MSU also has branches throughout Russia in many other cities as far away as Sevastopol to Vladivostok. There is a special boarding school for over 300 talented children. There are many legends about the underground area below MSU. Rumours say that in order to make the whole construction solid and stable because it was built on unsteady soil, engineers dug a deep foundation pit, poured it with liquid nitrogen and installed freezers. The freezers’ shelter is called the third basement and is a secret zone secured by the FSS (Federal System of Safety). So, if the freezers stop, the great building will drift into the Moscow River in just a week. The other myth is that Stalin planned an underground city for the country’s top rulers to survive in after a nuclear explosion, with MSU as the key element. The underground area continues to be a source of many urban legends. People say the city connects areas under the Belarus train station, the Russian State Library, the Kremlin and the Ministry of Defence. To this day, nobody knows how many grains of truth there are in these legends. MSU has a wonderful botanical garden with plants from all over the world: Asia, Australia, New Zealand, Japan and a lot of other countries. There is an excellent park with symmetrical alleys and a beautiful open space and sport centres, cafés, a jazz club and various student activities (a choir, a tour club, team games, theatrical performances, etc.). 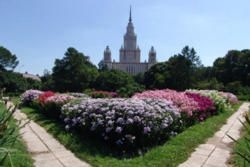 The park has the most popular highest point of Moscow, the Sparrow Hills, from which one may see a breathtaking panorama of Moscow. It is a nice place for a long talk and walk. Feel the spirit of inspiration which fills the air in this magic university land!